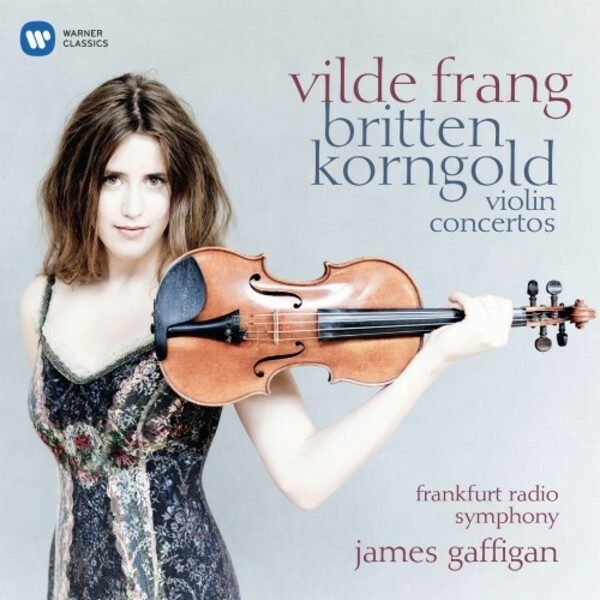 “I’ve dreamed of recording these two works together for a long time,” says Vilde Frang of the violin concertos of Erich Korngold and Benjamin Britten – two highly contrasted pieces that constitute a unique pairing on CD, and which have some fascinating points in common. This is the young Norwegian violinist’s fifth Warner Classics release. Early 2015 brought a programme devoted entirely to Mozart, but her previous concerto discs were also notable for imaginative musical matchmaking: Tchaikovsky/Nielsen and Sibelius/Prokofiev. Both concertos on this new disc were written when their composers were in the USA around the time of World War II: the Korngold was completed in 1945, the Britten in 1939. In the course of the 1930s Korngold, an Austrian Jew, had become a prominent Hollywood composer, but could not return to his homeland after 1938; the young Britten, a pacifist, left the UK for New York shortly before the declaration of war in 1939. Both composers had been child prodigies and both concertos are centred around the key of D, the most ‘natural’ key on the violin and the tonal focus for the violin concertos of Beethoven, Brahms, Tchaikovsky and Stravinsky. Vilde Frang describes the Korngold Concerto, which draws on several of his sumptuous movie scores, as “champagne, fireworks and indulgence … an ocean of emotions”. Korngold’s enveloping late-Romanticism is a world away from the more austere (but still sensitive and expressive) aesthetic that typifies Britten. As Vilde Frang says: “The first time I heard the Britten Concerto it was a new language for me, but it still spoke to me so strongly … I wanted to learn this language.” Many musical commentators have identified a thread of anxiety in the Concerto – hardly surprising in view of the year of its genesis. Perhaps this resonates especially strongly with Frang, who feels that a sense of vulnerability is crucial to the creative process of exploring and interpreting a piece of music.